Wirths, O. (2017). Preparation of Crude Synaptosomal Fractions from Mouse Brains and Spinal Cords. Bio-protocol 7(15): e2423. DOI: 10.21769/BioProtoc.2423. The current protocol describes the preparation of crude synaptosomal fractions from mouse brain or spinal cord samples. In detail, a sequential protocol yielding crude synaptosomal and light membrane fractions is provided. This fast and easy method might be sufficient to assess the amount of synaptic proteins in down-steam applications like Western-blot or ELISA in e.g., mouse models of Alzheimer’s disease or other neurodegenerative conditions. Analyzing synaptosomes, representing isolated synaptic terminals from neurons, can yield valuable information on synaptic integrity in diverse neurological diseases. They contain membrane-bound compartments that detach from axon terminals after brain homogenization under certain conditions. The current protocol describes a fast and easy method for the enrichment of crude synaptosomal fractions (see Figure 1). These can be either used for quantification of synaptic proteins by Western-blot or can be further purified using density gradient centrifugation to yield highly purified synaptosome subfractions (Gurd et al., 1974). 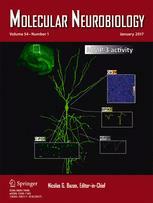 The preparation of crude synaptosomal fractions might be sufficient to assess e.g., the amount of pre- and post-synaptic proteins like SNAP25 or post-synaptic density protein 95 (PSD95) in e.g., mouse models with a neurodegenerative phenotype (Breyhan et al., 2009; Saul and Wirths, 2017). The following protocol has been used to extract crude synaptosomal and free mitochondria fractions from mouse brain samples from mouse models of Alzheimer’s disease (see Breyhan et al. and Saul and Wirths ). The user might need to modify the amount of solutions (e.g., lysis buffer) depending on the particulate downstream application (e.g., Western blotting or ELISA). For Western blots, we recommend to use 20 to 50 µg of total protein per well. This procedure will yield crude synaptosomal fractions with concentrations of approx. 7-10 µg/µl and microsomal and soluble enzyme fractions of approx. 4-6 µg/µl. For mouse brain preparation, animals were anesthetized by carbon dioxide (CO2) and sacrificed by cervical dislocation. Tissues were carefully dissected and either directly used or kept at -80 °C until further use. No differences were noted in yield or quality of the protein fractions if fresh or frozen tissue has been used. Mechanically homogenize fresh or deep-frozen brain hemispheres in a weight:volume ratio of 1:10 using cold lysis buffer (1,000 µl buffer per 100 mg tissue, see Recipes) with 10 strokes in a glass-Teflon homogenizer at 800 rpm (Figure 2). Note: Our lab uses one brain hemisphere with cerebellum and olfactory bulb removed and flash frozen on a plate of dry ice, however the presence of cerebellum or olfactory bulb does not compromise the procedure. For convenience, we do not remove the meninges upon harvesting the tissue. Transfer the homogenate to 1.5 ml reaction tubes. Spin the samples at 1,000 x g for 10 min at 4 °C to separate nuclei (Pellet P1). 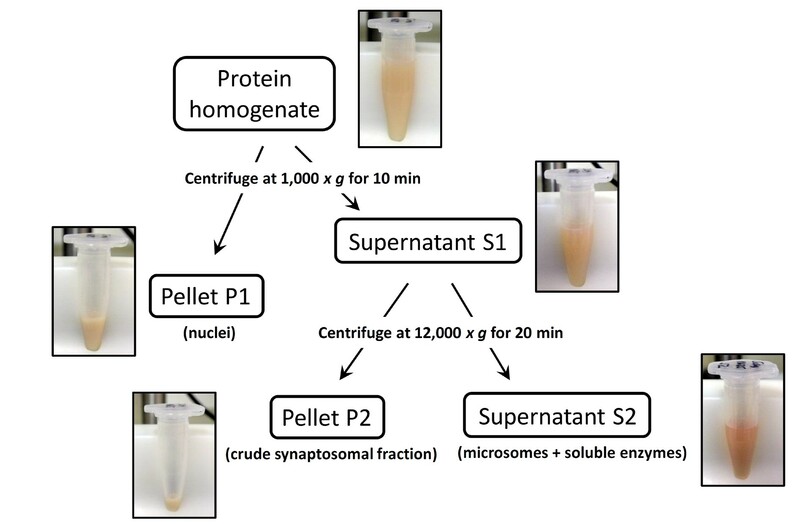 Remove the supernatant (S1) and transfer to a new 1.5 ml reaction tube. The pellet (P1) can be discarded. 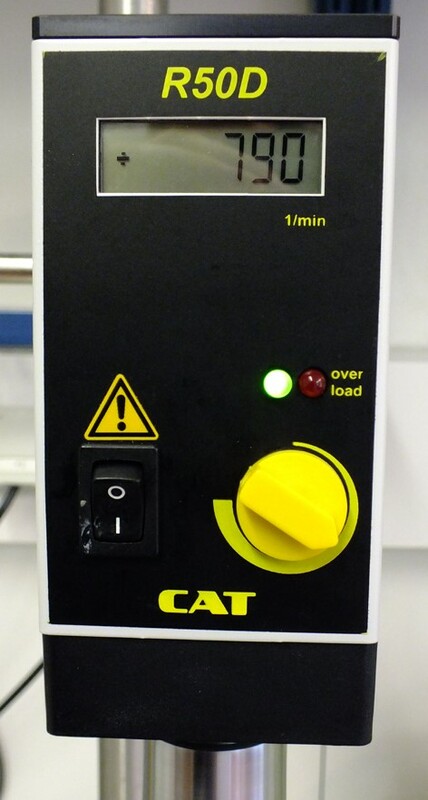 Spin the supernatant at 12,000 x g for 10 min at 4 °C and transfer the resulting supernatant (S2) containing the light membrane fraction and soluble enzymes to a new 1.5 ml reaction tube. Resuspend the pellet (P2) containing crude synaptosomes and mitochondria in 500 µl PBS (see Recipes). Homogenates can be stored at -80 °C until further use. The protein fractions obtained by using this protocol can be used in down-stream applications like Western-blot. 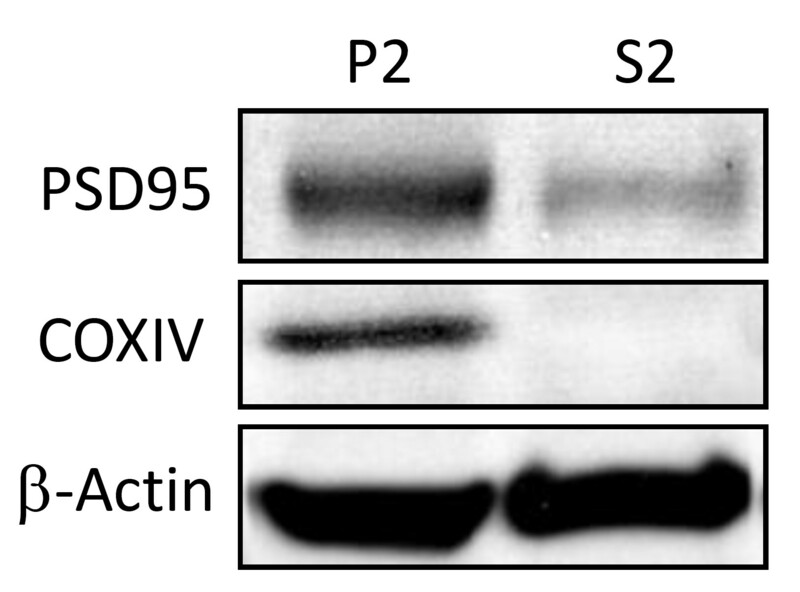 Successful enrichment of crude synaptosomes and mitochondria can be e.g., demonstrated by Western blot analysis using marker proteins like post-synaptic density protein 95 (PSD95) or cytochrome c oxidase (CoxIV) (Saul and Wirths, 2017) (Figure 3). Financial support of the Alzheimer Forschung Initiative e.V. is gratefully acknowledged. This protocol was adapted from Gurd et al. (1974) with modifications. Breyhan, H., Wirths, O., Duan, K., Marcello, A., Rettig, J. and Bayer, T. A. (2009). APP/PS1KI bigenic mice develop early synaptic deficits and hippocampal atrophy. Acta Neuropathol 117(6): 677-685. Gurd, J. W., Jones, L. R., Mahler, H. R. and Moore, W. J. (1974). Isolation and partial characterization of rat brain synaptic plasma membranes. J Neurochem 22(2): 281-290. Saul, A. and Wirths, O. (2017). Endogenous Apolipoprotein E (ApoE) fragmentation is linked to amyloid pathology in transgenic mouse models of Alzheimer’s disease. Mol Neurobiol 54(1): 319-327. How to cite: Wirths, O. (2017). Preparation of Crude Synaptosomal Fractions from Mouse Brains and Spinal Cords. Bio-protocol 7(15): e2423. DOI: 10.21769/BioProtoc.2423.